A bank of lights failed just prior to a pitch during Wednesday's Braves-Marlins game, bringing baseball's rules concerning power outages and other emergency procedures to the forefront. Umpires wait out the light outage delay. With one out and none on in the top of the 4th inning, Marlins pitcher Tom Koehler began his delivery to Braves batter Brandon Phillips as a series of field lights in Miami shut off, noticeably dimming lighting conditions throughout the ballpark and field of play. Koehler completed his delivery and Phillips hit the ensuing knuckle-curve on the ground to third baseman Miguel Rojas, who threw to first baseman Tyler Moore for the inning's second out. 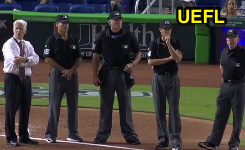 After the conclusion of that play, HP Umpire and Crew Chief Ted Barrett called "Time" to consult with his crew and the game experienced a delay as Marlins Park facilities staff restored power to the affected light bulbs. 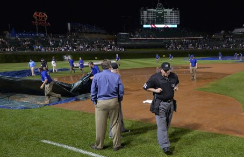 Umpires made the proper call in allowing play to continue until the out was recorded. (2) The ball becomes dead when an umpire calls 'Time.' The umpire-in-chief shall call 'Time'...When light failure makes it difficult or impossible for the umpires to follow the play. 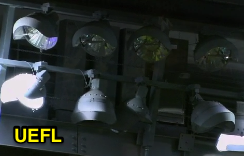 A number of lights failed during play in MIA. The consideration for calling "Time" in a partial or complete light failure situation is not simply whether or not a requisite number or percentage of field lights have shut off, it is whether the light failure has made it "difficult or impossible" for the umpires—not the players, coaches, or managers—to follow the play. Rule 5.12(b)(8) states, "Except in the cases stated in paragraphs (2) and (3)(A) of this rule, no umpire shall call 'Time' while a play is in progress." Accordingly, as Miami's partial light failure did not make it difficult or impossible for umpire Ted Barrett or his crew to follow the play, he properly kept the ball alive until such time as the play's completion allowed the ball to become dead in a natural fashion, after which he wisely held the game until such time as the lighting situation could be resolved. Hypothetical: Had Marlins staff been unable to remedy the problem, and this forced the game to be called, Rule 7.02(a) (formerly 4.12) holds that the game would become suspended—regardless of innings completed or the score: "A game shall become a suspended game that must be completed at a future date if the game is terminated for any of the following reasons...Light failure, malfunction of, or unintentional operator error in employing, a mechanical or field device or equipment under the control of the home club (e.g., a retractable roof, a tarpaulin, or other water removal equipment)." Wendelstedt observes Chicago's rain chaos. Rule 7.02(a)(3) (formerly 4.12(a)) was the rule involved in Major League Baseball's most recently upheld protest in August 2014, when the San Francisco Giants protested HP Umpire and Acting Crew Chief Hunter Wendelstedt's decision to call and make final the result of a 2-0 Cubs win in five innings, caused by Chicago grounds crew's inability to properly place Wrigley Field's tarp during a rain delay, which in turn resulted in flooding to the infield when umpires attempted to resume play. At the time, then-Rule 4.12(a) simply stated, "Light failure or malfunction of a mechanical field device under control of the home club. (Mechanical field device shall include automatic tarpaulin or water removal equipment)." In terminating the game and making it final, Wendelstedt explained, "by the baseball rulebook, there was nothing to put our hat on to suspend the game." MLB VP Joe Torre's office ruled the play a field device malfunction, but also agreed with Wendelstedt about the rule's deficiency, and the following season, the MLB Rules Committee voted to add "unintentional operator error in employing [the device]" to the rulebook. Miami light outage video via "Read More"